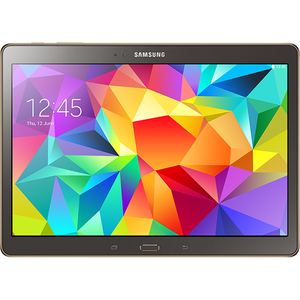 The Galaxy Tab S is the first Samsung tablet to be fitted with the highly praised Super AMOLED display. This, coupled with a 1600 x 2560 (double-HD) resolution, makes for one high quality display. Internal storage comes in at either 16GB or 32GB. This can be expanded with a microSD card, up to 128GB. Other features include an 8MP camera, fingerprint reader and large capacity battery. The 8.4" with a 4900mAh battery and 10.5" a 7900mAh battery.